Page of "How to Download all the Instagram Photos ?". Instagram is the most popular Photo sharing App that came into existence on 2010 as a IPhone App and later it ported to Android also.Instagram is changing the way that the photos are shared across web and Facebook recognized its potential and bought Instagram for $1 billion.If you use Instagram then you might also want to backup your photos to your local Hardisk. 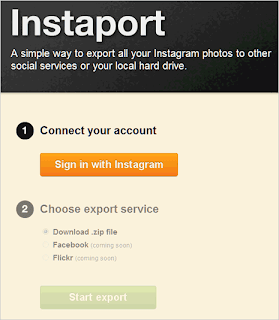 1.visit instaport.me and authorize your Instagram account. 2.When the authorization is completed, choose “Download .zip file” option and click “Start export” to download all your saved Instagram photos onto your computer. Thats it you have your Photos in your computer.